Neeraj Mehta is an active performer and educator, having presented concerts, clinics and master classes in North America and Europe. With interests in a wide variety of percussive styles, Dr. Mehta has performed and recorded with numerous artists and ensembles including: Michael Udow, the Michigan Chamber Players, Alan Abel and Anthony Orlando of the Philadelphia Orchestra, New Music Detroit, Linda Maxey, Michael Spiro, John Santos, and Clyde Stubblefield of the James Brown Band. 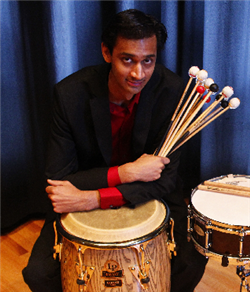 In 2008 Dr. Mehta was awarded a Fulbright Fellowship to study in Copenhagen, Denmark with solo-percussionist Gert Mortensen at Det Kongelige Dansk Musikkonservatorium (DKDM). While in Copenhagen, he premiered and recorded En Lys Timer (A Light Hour) by famous Danish composer Per Nørgård with Percurama. He also collaborated with composer Ole Buck on his percussion solo Rejang, and performed with the New Jungle Orchestra. At DKDM, Dr. Mehta also studied with timpanist of the Berlin Philharmonic Weiland Welzel and Swedish marimbist Johan Bridger. In addition to his contemporary percussion work in Denmark, he studied and performed with retired percussionist of Conjunto Folklorico Nacional de Cuba, Ignacio Guerra Acosta, and performed clinics in Afro-Cuban percussion with conguero of the Carlos Santana Band, Raul Rekow. As Guest Artist, Dr. Mehta performed and presented lectures on Danish percussion music at numerous American institutions including: Ohio University, Eastern Michigan University, University of Wisconsin, Lawrence University and Northern Illinois University. Formerly the principal percussionist of the Wyoming Symphony Orchestra, Dr. Mehta’s orchestral work has included performances with the Detroit Symphony Orchestra, the Madison Symphony Orchestra, the Wisconsin Chamber Orchestra and other regional orchestras. He is also deeply committed to the performance of new works for solo and contemporary chamber ensembles, and has worked with many internationally recognized composers including: Bright Sheng, Michael Daugherty, Virgil Moorefield, Steven Dembski, Michael Udow, Russel Hartenberger, Bob Becker and Dave Hollinden. He most recently commissioned Frantic, Gnarly, Still by Opera Company of Philadelphia Composer in Residence Lembit Beecher for violin and multiple-percussion. led the Mehta Jazz Group from the drum kit and performed regularly with Latin bands in the areas where he has lived. He has appeared at numerous venues and festivals including the University of Toledo Jazz Faculty Concert Series, the Isthmus Jazz Festival, and the Jazz at Five Summer Music Series. As conguero and percussionist with the Afro-Cuban jazz quartet Nuevo Rumbon, he has been featured at Jazzloop 2007 and the Art Tatum Heritage Jazz Festival. At the University of Michigan, Dr. Mehta served as director of the University of Michigan World Percussion Ensemble, as well as the UM Vencedores Samba Band. He was also a 2007-2008 graduate fellow of the University of Michigan Center for World Performance Studies, receiving a grant of $10,000 to conduct fieldwork in Afro-Cuban folkloric drumming. Neeraj Mehta is currently Visiting Assistant Professor at the University of North Carolina at Greensboro School of Music, Theater and Dance. He received his Doctor of Musical Arts and master’s degrees at the University of Michigan and holds a bachelor of music degree from the University of Wisconsin-Madison. Dr. Mehta is an artist/endorser of Innovative Percussion, Inc. sticks and mallets and Remo Drumheads.